(PhysOrg.com) -- Led by a group at the University of Maryland (UMd), a multi-institution team of researchers has combined modern materials research and an age-old metallurgy technique to produce an alloy that could be the basis for a new class of sensors and micromechanical devices controlled by magnetism. The alloy, a combination of cobalt and iron, is notable, among other things, for not using rare-earth elements to achieve its properties. Materials scientists at the National Institute of Standards and Technology (NIST) contributed precision measurements of the alloy's structure and mechanical properties to the project. To find the best mixture of metals and processing, the team used a combinatorial screening technique, fabricating hundreds of tiny test cantileverstiny, 10-millimeter-long, silicon beams looking like diving boards and coating them with a thin film of alloy, gradually varying the ratio of cobalt to iron across the array of cantilevers. They also used two different heat treatments, including, critically, one in which the alloy was heated to an annealing temperature and then suddenly quenched in water. Quenching is a classic metallurgy technique to freeze a material's microstructure in a state that it normally only has when heated. In this case, measurements at NIST and the Stanford Synchrotron Radiation Lightsource (SSRL) showed that the best-performing alloy had a delicate hetereogenous, nanoscale structure in which cobalt-rich crystals were embedded throughout a different, iron-rich crystal structure. Magnetostriction was determined by measuring the amount by which the alloy bent the tiny silicon cantilever in a magnetic field, combined with delicate measurements at NIST to determine the stiffness of the cantilever. The results, says team leader Ichiro Takeuchi of UMd, are lower than, but comparable to, the values for the best known magnetostrictive material, a rare-earth alloy called Tb-Dy-Fe (Terbium-dysprosium-iron.) -- but with the advantage that the new alloy doesn't use the sometimes difficult to acquire rare earths. "Freezing in the heterogeneity by quenching is an old method in metallurgy, but our approach may be unique in thin films," he observes. "That's the beauty -- a nice, simple technique but you can get these large effects." 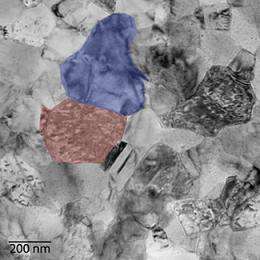 The quenched alloy might offer both size and processing advantages over more common piezoelectric microdevices, says NIST materials scientist Will Osborn. "Magnetorestriction devices are less developed than piezoelectrics, but they're becoming more interesting because the scale at which you can operate is smaller," he says. "Piezoelectrics are usually oxides, brittle and often lead-based, all of which is hard on manufacturing processes. These alloys are metal and much more compatible with the current generation of integrated device manufacturing. They're a good next-generation material for microelectromechanical machines."